The incoming Class of 2020 is greeted this semester by Blossom, a mission-centered artwork that represents all that can be achieved through a Manhattan education. 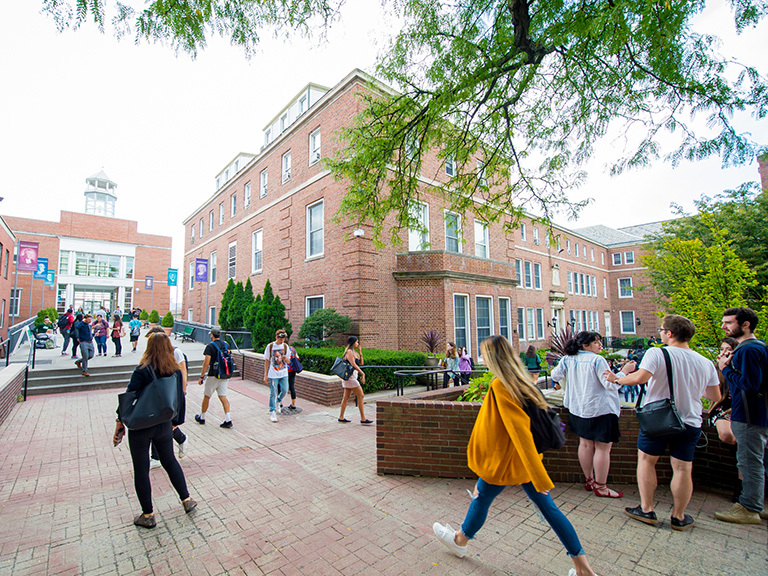 Splashed across the wall underneath Founder’s Bridge is a larger-than-life mural that depicts life on our campus, including a colorful rendition of the 1 train, the famed Chapel cupola and the Lasallian star. The mural, entitled Blossom, is a transformative piece that illustrates the knowledge our students gain throughout their time here, and how they’ll apply it to make the world a better place. The name Blossom is a nod to the journey a student undergoes in college, and a reference to the mural element depicting the iconic flowering magnolia tree on campus. The artwork was revealed to the public on May 18, 2016. It reflects the work of 12 student artists from the Schools of Liberal Arts, Science, Engineering, and Education and Health, who spent the semester creating a work that tells who they are, and what the College means to them. Mark Pottinger, Ph.D, the chair of Manhattan’s visual and performing arts department and an associate professor of music at the College, orchestrated the creation of Blossom. 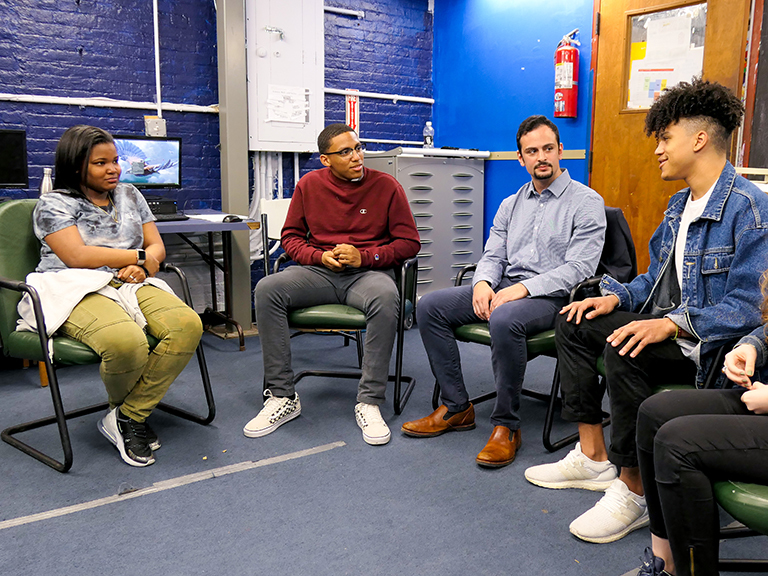 The project was also aided by teaching artists of Creative Art Works, a nonprofit that provides dynamic visual arts and multimedia experiences to thousands of New York City youth each year. Learn more about the student muralists who created Blossom, Manhattan College's first piece of public art. Back when the mural was still a blank wall adjacent to the lower level of Thomas Hall, students were asked why they wanted to participate in its creation. Many, like English major Leah Cordova ’17, saw it as a way to leave a lasting mark on campus. “I've been involved with lots of things but not something that I'll be able to come back and visit and actually see," Cordova said. Allison Tantakarn ’19, an electrical engineering major, thought afternoons of painting would complement her math and science-heavy coursework. The other contributors relayed similar feelings at the reveal ceremony held in late spring. At the event, each of the muralists — Natalia Alvarez ’19, Taylor Brethauer ’19, Liz Bruchansky ’18, Robert Constant ’19, Leah Cordova ’17, Jean Manning ’16, Cheyenne McElhiney ’17, Carlos Perez ’16, Leah Reiner ‘19 and Paul Roditis ’17 — took turns describing the elements of Blossom they individually worked on, and their reasons for wanting to get involved with the project. What the group created in partnership with Creative Art Works in just a few short weeks can be accurately described as a masterpiece. Pictured on the mural’s far left side is an image of the No. 1 train, which many students hop aboard from the nearby 242nd Street-Van Cortlandt Park MTA Terminal. This is how they get to New York City’s famed art museums, parks and other destinations. It’s also how they get to internships, and eventually, job interviews. On the right is a depiction of the College's Quadrangle, positioned in front of the roof and cupola of the Chapel of De La Salle. Between that and the 1 train is a pair of clasped hands color-blocked in varying shades of beige. The patchwork represents the stained glass windows the chapel was outfitted with this spring. It also mirrors the diversity of our student body. In the center of this mural is a green bench, much like the many benches that can be found around campus. This signifies the academic transformation a student makes from the classroom to career. Also at the center of the mural is a bright yellow Lasallian star. This highlights our commitment to embodying the principles of our founder, Saint John Baptist de La Salle, whether we’re on campus or exploring New York City. He calls us to be mindful of social justice and human dignity, to teach others the ways we can serve the community. Above all, he reminds us to reflect on our faith. The mural is a testament to the creativity of all Manhattan College students and empowers members of our community on the value of a Lasallian-based education, which gives hope to our world. Blossom is the first piece of public art at Manhattan College. The discussion of creating a campus mural had been in the works for several years but had never come to fruition until this year. Now that the mural is finished, one of its greatest returns will be for the handful of artists who made it a reality. Their names are now proudly presented on its bottom right corner, where, like the thousands of paintbrush strokes depicting images drawn from the millions of memories made and lessons learned inside and around this campus, they will remain a permanent fixture of Manhattan College. The mural is a sprawling tapestry of experience that shapes our students, so that they can change the world for the better.